Made by Gottlieb in May 1967. This is a two player game where the theme is 'Pinball.' The unusual feature of this game is a roulette wheel. I believe this machine has a four-player cousin called Hi-Score. A photo of the backglass can be found in Pinball! by Sharpe. An excellent picture of the game can be found in Pinball: The Lure of the Silver Ball, by Flower, page 61. The only problem with the picture is the cabinet colors are different from mine. Mine are red and blue on white, whereas the picture is green and yellow on white. I believe the green and yellow color were only on the prototype. 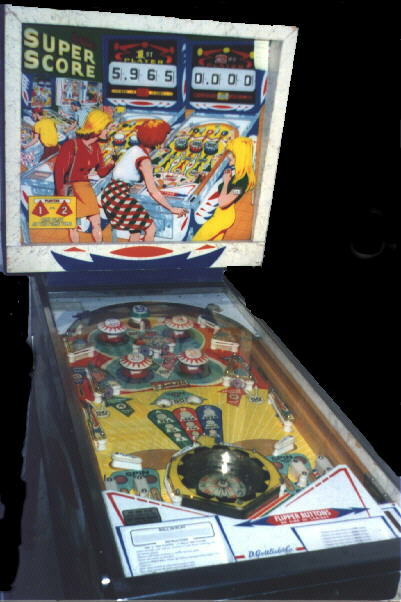 Backglass: A 1960s pinball parlour. The scoring reels are shown as being part of pinball machines in the foreground. In the background one can see a couple identifiable Gottlieb pinballs--Bank-A-Ball (1965), and Ship-Mates (1964). Playfield: Symmetrical layout with four pop bumpers. The center has two eject holes which alternate being lit. The flipper layout is similar to some other games with a roulette wheel--Suspense, Williams 1969, and A-Go-Go, Williams 1966. The roulette wheel is centered just above the outhole. Two flippers are on each side of the playfield at the top of the wheel. This arrangement looks something like the diagram below. The flippers are paired so that the two flippers on the left of the roulette wheel are controlled by the left flipper button, and the two flippers on the right by the right flipper button. This takes some getting used to. Most people are used to having the left flipper button control the left-handed flippers and the right flipper button control the right-handed flippers. The roulette wheel scores A, B, C, or Star. The Star scores an extra ball. The letter scores advance depending on what targets have been hit. Cabinet: Colors are red and blue on a white background. The stenciled shapes are geometric designs. This machine has always been a popular part of my collection. It always seems to get a lot of play. It has also been popular with visiting collectors. Everyone seems attracted by the roulette wheel feature. This is the second machine in my collection. I have sold every other machine that I owned at that time. When I bought this game it had no signs of life. It had duct tape over the center eject holes, and looked sorry. I figured for the price I couldn't lose. I tinkered with it for a couple of months and got almost everything working. Finally, I was stumped and had to get a schematic. Thanks to David Marston, I was able to get a schematic. It turns out that a couple of the switches on one of the relays were in backwards. I would never have discovered that without a schematic. After a while I was convinced that the machine was still not working properly. I thought that the A B C advance should be reset at the beginning of each game. But after checking the schematic I realized that it was designed to not be reset. This "feature" was to entice the player to play another game! This game is one of my sentimental favorites. It was this machine that allowed me to learn how to repair machines, and taught me the principles of electro-mechanical circuits.